It was obvious from the recent comments on Facebook that my books are somewhat confusing. There have been 15 written so far and some of the books have been updated. Some have been updated significantly several times. Here's an update on the books that have been changed the most. Starting in 1994, Plants of the Metroplex has gone through several complete updates. Besides the plants and planting instructions being improved, the earlier versions were done before I became organic. The book on the far right is the most current. The Organic Manual was my first organic publication and was originally written as a seminar handout. Requests for additional copies led to the discussion to publish it into the white cover version you see above. Through the years it had several updates ending in the current red cover version on the right. It was my first non-regional book. It is useful coast to coast and border to border. Original book on the left. 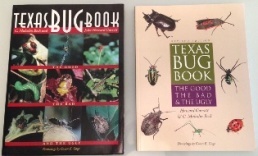 The Texas Bug Book had one cover change along with a major revision and update of the photos and information. Here is a link with more information about each book: click here.